Railpictures.ca - A.W. Mooney Photo: Street Running!!! In this classic St. Catharines scene, CN 7168 has just serviced various industries inc. GM on Ontario St. and with a small train in tow, is returning to Merritton. Its a two way street, and motorists can be seen bunching up behind the freight as it trundles along at a stately 10 MPH. All the old SW8s in this series were off the roster by 1989, and these tracks themselves have been gone from this street many years. | Railpictures.ca – Canadian Railway Photography – photographie ferroviaire Canadienne. Caption: Street Running!!! 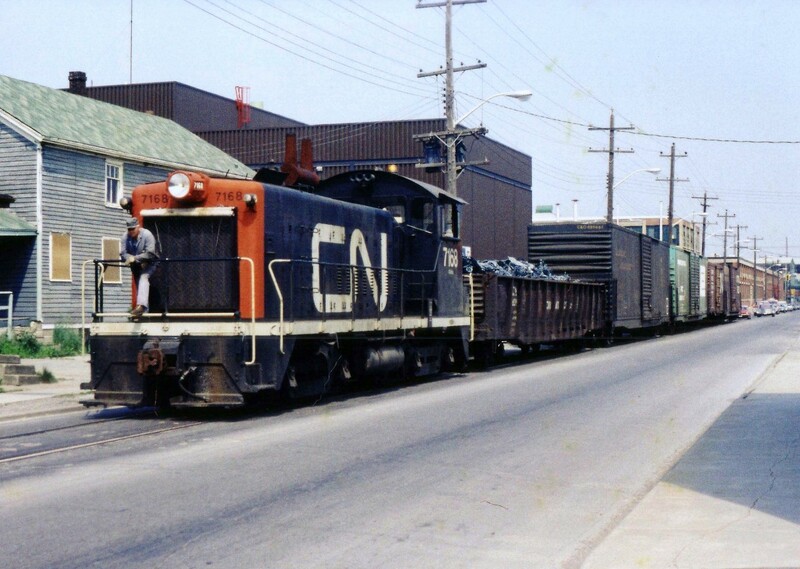 In this classic St. Catharines scene, CN 7168 has just serviced various industries inc. GM on Ontario St. and with a small train in tow, is returning to Merritton. Its a two way street, and motorists can be seen bunching up behind the freight as it trundles along at a stately 10 MPH. All the old SW8s in this series were off the roster by 1989, and these tracks themselves have been gone from this street many years. Ah, yes, Mr.Smith. January of 1989 incident. Knocked off a tree as well. Louisa Street was the location of the infamous train derailment. A train heading to the GM plant derailed the last truck on the last boxcar of train. The boxcar stayed upright and rolled along the asphalt hitting every parked car on one side of the street, at least a dozen autos were damaged. Forgotten the route Mike, but I know they ran Louisa St. There was trackage all over at one time, reminents of the old NS&T. I recall seeing evidence of this operation back in 1997, but was hard to believe by that time that tracks ever made it this far into town. Did they take Louisa Street and then Welland Avenue back to the still existent trackage around Yale Crescent? Great shot of this gem of an operation, Arnold, and thanks for taking the time to record it on cellulose! To my mind, perhaps the most fascinating aspect of railroading were these urban spurs.